My creativity runs on coffee, and quilting is the way I espresso myself! 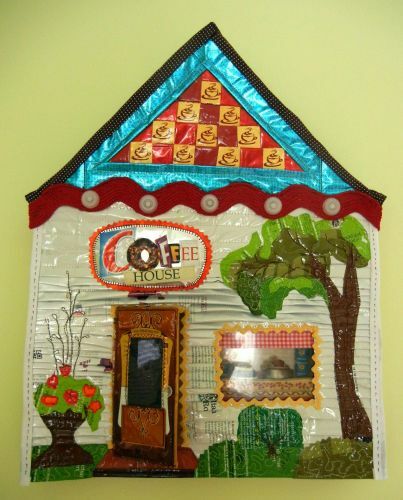 I’m a green gal, so I buy and drink fair trade coffee, and I built my house with a trash stash of coffee bags and teabag wrappers. Come in and smell the coffee: as diligent as I was in cleaning the used packaging, I’m sure some grounds remain. Let your mini-me sit down and share some coffee and quilting conversation with my mini-me!